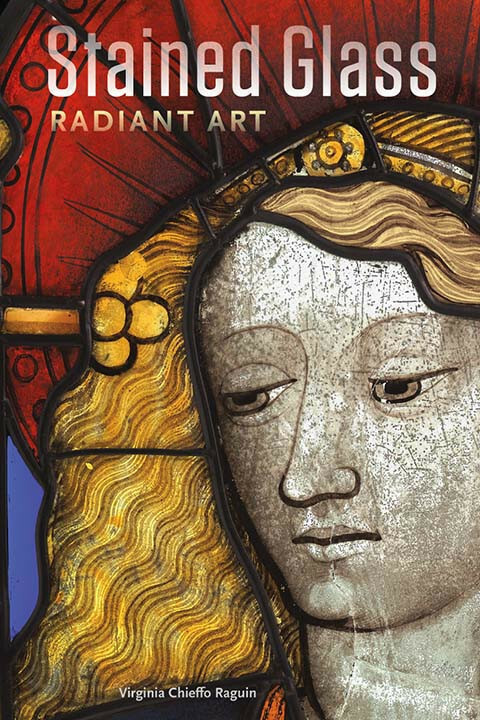 In this slim trade paperback published by the J. Paul Getty Museum in 2013, readers are treated to an overview of medieval stained glass as an art medium, an academic topic of study, and as a prized portion of the collection of the Getty. Virginia Chieffo Raguin discusses themes of ownership, patronage, manufacture, and function in her carefully arranged chapters. Her explanations are clearly worded, with carefully chosen examples to illustrate. Many of the photographs are full-page color images and several are larger than the actual panel shown. The majority of the pieces studied are from the J. Paul Getty Museum collection, with a few comparative examples from other collections or extant in European buildings. Her text begins with a discussion of the Getty’s recent acquisitions which propelled the creation of this publication, then takes the reader back into the Middle Ages with an explanation of how stained glass was manufactured. Raguin then addresses the architectural context for stained glass, considering its place in cathedrals, monastic foundations, parish churches, and heraldic images in private buildings. She considers the place of stained glass in the spectrum of medieval art forms, and explores the likelihood that artists in the high and later Middle Ages produced art in multiple mediums. Raguin does not discuss at length the story or symbology of the characters and images in her examples, but discusses the relationship between the glass and the viewer. Many of the images are composed to appeal to the greater public, to inspire a meditative state and to help the viewer feel closer to the presence of Christ’s humanity. If a patron or a donor is represented in the window, then Christ or holy figures accompany or bless the patron. Throughout, she focuses on the reliance on patrons for the very existence of stained glass. Wealthy patrons supported the artists, glaziers, painters, smiths, and other artisans which produced the windows. Over the course of the Middle Ages, the shift in economy and politics to a more regional focus led to more stained glass installed in parish churches and private residential buildings, rather than great cathedrals and monastic churches. With an increase in the income of the lesser nobility and the merchant class in the high and later Middle Ages, patrons began investing in their local communities. An increase in parish church stained glass and heraldic windows was the result, and mirrored the increase in portrait commissions, print series, and illustrated frontispieces of books which featured heraldic symbols and familial affiliations. Rather than the goal of bringing the congregation closer to Christ, much of the commissioned glass in this period was created with the aim of shining the spotlight on the patron’s family ties or guild. Raguin finished the section on art mediums, style, and patronage with some examples showing heavy influence of the Italian Renaissance style, with a focus on Latin, the form of the human body, and attention to Classical elements. The last two sections focused on the history and present practices of collecting medieval stained glass, and the restoration and display of stained glass. Raguin outlines some of the historical movements which affected the status and desirability of medieval glass such as religious turbulence, preferences for interior décor and architecture, and art definitions. Presently, stained glass is seen as a manifestation of medieval culture and expression and is treated as fine art. As such, it is frequently limited to the realm of prestigious museum collections and elite private collectors. When evaluating past and present techniques for restoration, Raguin barely dips into the technical elements but does point out restoration or replacement panels of various age to illustrate the differences between medieval versus not medieval. She also discusses how stained glass, along with many other forms of fine art, used to be displayed in an isolated fashion in museum galleries, asking the observer to reflect on each individual piece’s merit. Current trends in exhibition now move towards exhibiting glass in context with related art forms or other medieval artifacts.